Chances are when you had your cup of coffee this morning, you threw out the grounds like yesterday’s old newspaper. You are probably already aware that repurposed grounds can be used around the house or garden, but did you know that they can also be an excellent tool in your beauty routine? Over-the-counter products can be costly, but coffee grounds are a low-cost solution to save a few bucks while still getting great results. Besides, you don't have to worry about unknown ingredients! Before you toss out your next filter, take a look at these beauty routines that require coffee grounds. Coffee proves to be a great remedy for damaged skin. 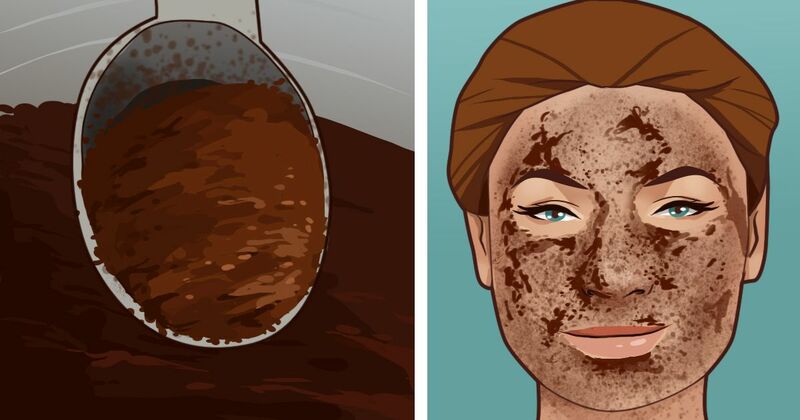 Apply a coffee facial to your skin to help remove dead skin, unclog pores and soften the lines of wrinkles. Not only does the texture work for exfoliating, but the acid found in coffee contributes to exfoliation as well. According to Prevention, it is simple to make this scrub. Place the grounds in a bowl of warm water and then add Epsom salt. Rinse your face with the water and gently rub skin with the rough grounds and salt. Rinse the mixture once again with the water from the bowl. Your face will feel soft and fresh! Do you have annoying cellulite? You might want to try a coffee scrub on your problem areas. According to Organic Authority, the caffeine in coffee helps stimulate circulation, which removes extra water from the skin, making it appear firmer. To make the scrub, mix ½ cup (120 ml) coffee grounds, 1 tablespoon (15 ml) wine, 1 tablespoon (15 ml) tincture (follow this recipe for tincture) and a few drops of ginger extract and seaweed extract. Rub on your skin and enjoy the benefits. There are a ton of ways for blondes to keep their color true, but let’s not forget about the brunettes. Prevention indicates that the hue of coffee can enhance the richness of dark hair. Simply mix coffee and water to form a paste and apply directly to freshly shampooed hair. In the hustle and bustle of everyday life, most people are not getting adequate rest. If you wake up to dark circles and puffy eyes, know that there is a treatment for you. Not only does coffee help wake you up, but the same properties can work to stimulate blood flow to your eyes, thus reducing that tired look. Apply the grounds under and near your eyes and allow them to set a few moments before rinsing away. Do you need an extra shot of caffeine? Natural Living Ideas indicates that your skin can actually absorb caffeine, thus giving you the energy boost you may need to get through the day. If drinking a warm cup of brew isn’t exactly your thing, you can opt to make it into soap for a similar benefit. Another great option for boosting your skin is by making coffee ice cubes. According to Stylecaster, you can improve blood circulation and the overall look of your skin by rubbing a coffee ice cube along problem areas of your face. Just as important as hair health is scalp health. To rejuvenate your scalp, you can use coffee grounds to exfoliate and remove dead skin. This will keep your skin healthy and promote hair growth. Many people suffer from dry skin on their feet. If you do, too, then check out the coconut oil and coffee ground scrub described in Stylecaster. The recipe for the soak includes 1 cup (240 ml) coconut oil, ½ cup (120 ml) ground coffee, and 1 teaspoon (5 ml) vanilla extract. Mix and put in a tub of warm water. Allow your feet to soak for 10 minutes. The reason this is an effective solution is because of the antioxidant properties of the coffee coupled with the moisturizing effect of the coconut oil. Your feet will love you for it. Enjoy your espresso, but remember to save the grounds so you can use them in your beauty routine. Don’t keep it a secret—share with your friends!